“Ok”, I thought…”what the hell could this be?” as I clicked my left mouse button. 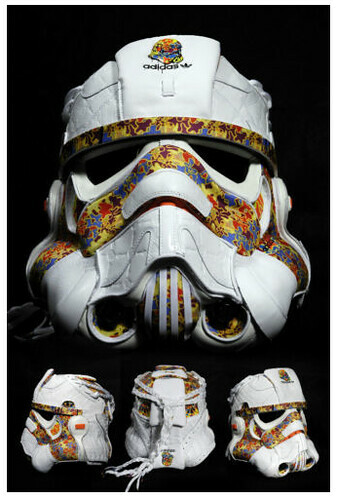 Now there are many things I love in life but Star Wars and Adidas are ranked right up there, so when I found out about this artist who made a Storm Trooper helmet out of Adidas Tennis shoe parts, I had to find out for myself. So what is one to do when one doesn’t know where to begin looking for something? Thats right, I Googled it! And man, was I blown away with what I found out. 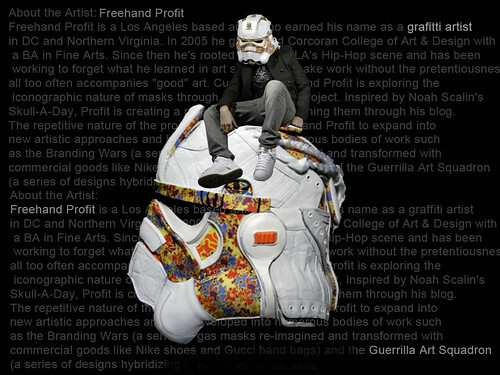 I found this amazing Los Angeles based artist name “Freehand Profit” whose work is as dope as his Nom de plume! 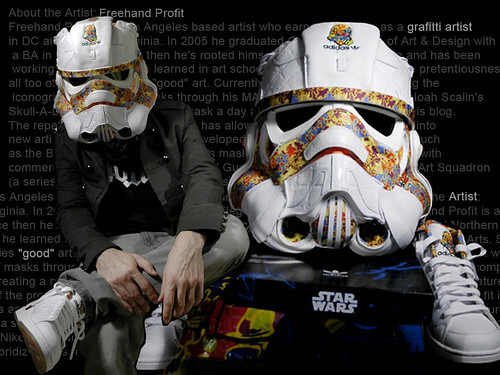 As I scrolled through his blog perusing the “fresh” that is “Freehand Profit”, I finally stumbled on the Holy Grail of Tennis Shoes turned Helmet: “The Adidas X Storm Trooper Helmet”. Obviously, the next thing that runs through my pea brain is “I want it, I gotta have it, where do I go get it?” Where does one go to get one of a kind art pieces? Why, EBAY of course! 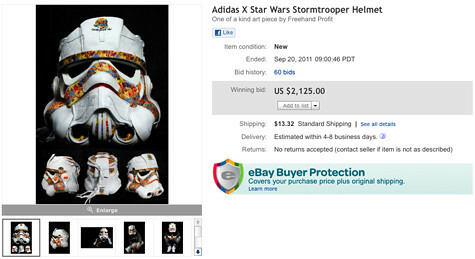 I did some searching and guess what… there was the helmet on ebay but it wasn’t alone, it brought along with its “Empire” sized price tag. 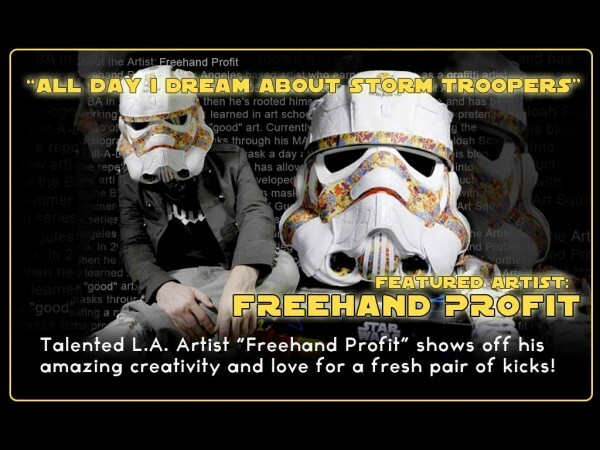 My hopes where dashed and the reality of me being a Break Dancing Storm Trooper seemed far, far away. Check out Freehand Profits website here. 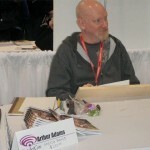 A big “Thank you” to Shane B. for turning me on to this story. 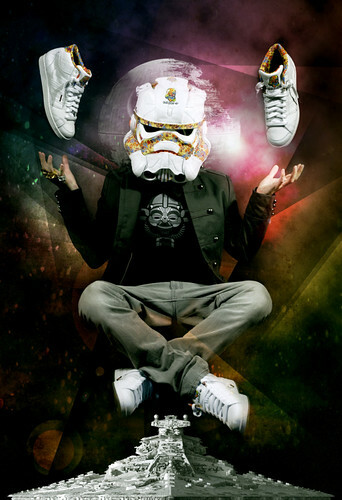 All Images, Characters, Logos and I.P are property of Lucas Arts and are not owned by AlienCyborgs.